Well today was pretty fun especially since it started out with a two hour easy spin around the lake with Rick, where we talked about strategy for the upcoming Tour of KC. He also gave me the low-down on how he did at his corporate challenge time trial. “RIDE ME” No Thanks Rick! At about the halfway mark Rick rode home so I ended up riding an hour by myself. I was a little worried because the sky was getting pretty dark, so I stayed pretty darn close to the house incase it started to rain I could book home quickly. Its certainly good to be able to see some moisture in the air, because at Flagstaff it was dry as a bone. After that I headed over to my Grandparents were we would have a fathers day dinner. It was a very cool meal because we had all of my Grandpas brothers in town for the dinner and this doesn’t happen too often. So after a very enjoyable dinner we headed over to Rick and Shari’s to pick up the TT bike for my upcoming races. 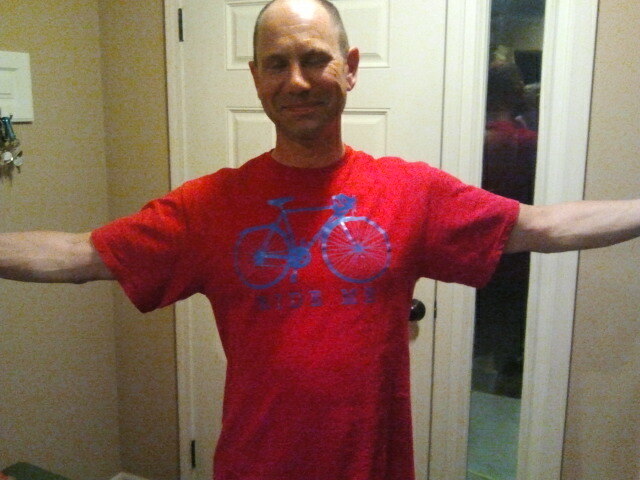 After knocking on the door we were greeted by Rick who was wearing a shirt that said; “ride me”. At seeing this I immediately bursted out laughing. Then hearing Rick ask me what was so funny I told him about his shirt. He had walked around all day with this thing. I don’t know what’s going on with Rick but I want nothing to do with it. Thanks again to Shari and Rick for loaning me there TT bike its quite a blessing and I’m very honored for them to even consider it. ← Here’s the Lowdown On The US Selection Camp And How It All Shook Out; Its All Fantastic!